Anyone that knows me will tell you I go overboard with getting things done early. I have been like that as long as I can remember. Wynn's birthday is in January, and we are having an ice cream party for two reasons. 1. Wynn likes ice cream and 2. 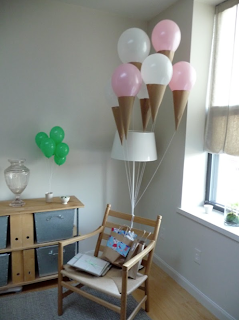 I was able to get a lot of items that were ice cream related on clearance at the end of the summer to use for the party. 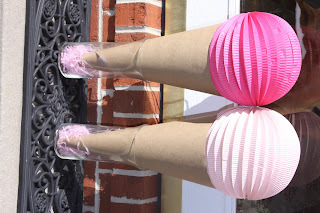 I purchased some paper lanterns from Joann's for $3 bucks. There were three large and four smaller sizes in the package. I was inspired by a pin that I am sharing below a while back. I went for a similar idea by using the lantern, some packaging paper and a glass vase from the Dollar Tree. I simply created a cone shape, placed the lantern on top of it, and then placed them in the vase so that they could stand up. I basically spent a total of $1 making both of these because I already had the packaging paper and the vase. I plan on using them on the table at her party. I am also thinking about hanging them as well since it would be easy to do that. The project that was the inspiration was done by Oh Happy Day. I wanted to use balloons originally but with the helium shortage going on it made me think about what else I could use that I already had lying around. Thanks for stopping by and checking out this simple project. I cannot wait to put it together with everything I've made so far. Oh my gosh how adorable! So cool! the texture from the paper lanterns give them a real feel! With as far in advance as you are planning, I am sure this ice cream party will be an affair to remember. I love these icecream cones. They are adorable and will definitely help set the tone for your party. I can't wait to see what comes next. Super cute idea - I love that substitution even more! LOVE the cones!!! I'll have to plan a party just to do them! Very cute. Love the colors and theme idea. So cute! I admire you in getting things done early. I'm the complete opposite, hence finishing my Package Pal surprise one day before the posting deadline! I hope you receive it soon anyway! I totally want to do this when I have another ice cream party! Love it! So cute!! This is a great theme! Thanks for linking up at Romance on a dime.